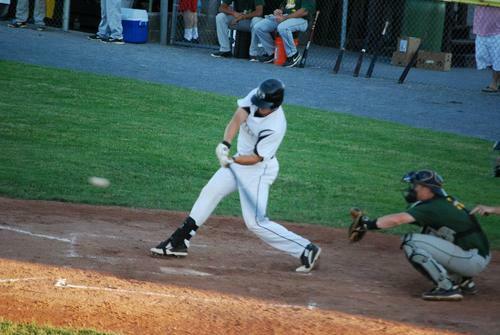 Matt Diorio, shown here batting against Mohawk Valley, was selected to the first team All-PGCBL for the 2014 season. Photo Courtesy of Warren Shelmidine. Amsterdam highlights the first team with six selections. The Mohawks set a PGCBL record with 36 wins this season, beating their 2012 mark of 35 wins. Elmira has the most selections of any West Division team, having four players named to the team, including the only unanimous selection, first baseman Christian Santisteban. PGCBL Player of the Year Josh Gardiner of the Amsterdam Mohawks was named to the first team, alongside PGCBL Pitcher of the Year, Jayson Yano of the Newark Pilots. Newark, which won the West with a 27-19 record, also had shortstop Tanner Giesel named to the first team. Matt Diorio has been named to the first team All-PGCBL after hitting .352 in 28 games for the Watertown Rams. Diorio led the club with 24 RBIs and clubbed three home runs. His 1.005 OPS was the highest on a Rams team that went 24-21 and advanced to the postseason for the second consecutive season. On June 22, the Staten Island became just the second player in PGCBL history to hit for the cycle. A full story on his cycle can be found here. Christian Santisteban has been named to the first team All-PGCBL after hitting .305 for the Elmira Pioneers. Santisteban topped the Pioneers in both on-base percentage and slugging percentage, finishing with an OPS .904. He led the team with 32 RBIs, which was the third most in the PGCBL. Santisteban hit .322 (19-for-59) with runners in scoring position and dominated right-handed pitching, hitting .336 off right-handers. He was the only unanimous selection to the All-PGCBL team. Josh Gardiner has been named to the first team All-PGCBL a day after being named the 2014 PGCBL Player of the Year. Gardiner, a rising senior at Radford, led the PGCBL with a .543 on-base percentage and finished second in the league with a .415 batting average. Gardiner’s .543 on-base percentage set a new league record, topping the .497 marks of 2013 PGCBL Player of the Year John Nogowski and the 2012 PGCBL Player of the Year Ross Kivett. A full recap on Gardiner’s season can be found here. Tanner Giesel has been named to the first team All-PGCBL after hitting .327 for the West Division champion Newark Pilots. Geisel led the PGCBL with 39 runs scored and 35 RBIs. His 13 doubles were tied with Christian Santisteban for the most in the league. The Naperville, Illinois native finished the season with 78 total bases, tied for second most in the PGCBL. Zach Collett has been named to the first team All-PGCBL after hitting .312 for the 26-19 Mohawk Valley DiamondDawgs. Collett finished tied with Mark Williams of the Adirondack Trail Blazers for the most home runs during the 2014 season (6). His 30 RBIs were the fourth most in the league and his 78 total bases were tied for the second most in the league. Collett’s .928 OPS led Mohawk Valley and he hit 12 doubles, tied for second most in the league. Mike Carter has been named to the first team All-PGCBL after winning the 2014 batting title with a .430 batting average. Carter finished the season 58-for-135 and scored 37 runs, fourth most in the league. His 80 total bases were the most in the league and he posted an on-base percentage of .516. His overall OPS was 1.109 and he drove in 23 runs, despite hitting at the top of the order for most of the season. Carter’s four home runs was tied for third most in the PGCBL. TJ Dixon has been named to the first team All-PGCBL after hitting .339 for the Elmira Pioneers. Dixon’s 62 hits were the most in the PGCBL and his 38 runs scored were tied for the second most in the league. The Samford product posted a .399 on-base percentage and had 74 total bases. His .339 batting average was the fifth highest in the league. John Razzino has been named to the first team All-PGCBL after hitting .370 for the record breaking Amsterdam Mohawks. The .370 batting average was the third highest in the PCGBL and Razzino’s five home runs was tied for the second most in the league. An overall OPS of .960 was the second highest on the 36-11 Amsterdam team. The Franklin Pierce product drove in 34 runs, second most in the league and led the league with 23 stolen bases in 26 attempts. During scout day activities at the 2014 PGCBL All-Star Game, Razzino ran the fastest 60-Yard dash time (6.4 seconds). Marcus Carson has been named to the first team All-PGCBL after hitting .346 for coach Keith Griffin. The .346 mark was the fourth highest in the PGCBL and his 38 runs scored were tied for the second most in the league. Carson stole 14 bases in 18 attempts and had 57 total bases. As the leadoff man, Carson reached base in 32 of 67 opportunities, good for a .478 mark. Zac Bellinger has been named to the first team All-PGCBL after hitting .296 for the Elmira Pioneers and showcasing great power throughout the season. Bellinger slugged five home runs for coach Matt Burch, tied for second most in the league. He posted a .453 slugging percentage and drove in 25 runs. Bellinger also won the 2014 PGCBL Home Run Derby prior to the 2014 All-Star Game at Dunn Field in Elmira. He hit four home runs in the final round to defeat Mark Williams of Adirondack. Taylor Blatch has been named to the first team All-PGCBL after going 5-1 for the Amsterdam Mohawks. Blatch posted a 1.80 ERA in 7 starts and held hitters to a .163 batting average. The right-hander struck out 37 batters in 40 innings pitched. On July 27, Blatch became the second pitcher in PGCBL history to throw a no-hitter. He did so against the Utica Brewers in game one of a doubleheader. A full recap of Blatch’s no-hitter can be found here. Bryson Hough has been named to the first team All-PGCBL after going 5-0 for the Elmira Pioneers. Hough’s 1.02 ERA was the lowest among qualified starters, as he allowed just six earned runs (eight total) all season. The right-hander struck out 41 batters in 53 innings and was the starting pitcher for the West Division at the 2014 PGCBL All-Star Game. Opponents hit just .179 off the Bucknell product and left-handers went just 7-for-59 (.119) off him. Jayson Yano has been named to the first team All-PGCBL a day after being named the 2014 PGCBL Pitcher of the Year.Yano, a rising junior at Stevens, led the league with six wins while posting an ERA of 1.35, which was second best among qualified pitchers. Opponents hit just .221 off the right-hander, tied for third best in the league. He led the league with five complete games. Yano struck out 41 batters in 53.1 innings, good for fifth (tied) and third best in the league. A full recap of Yano’s season can be found here. EJ Ashworth has been named to the first team All-PGCBL after going 5-0 for the Amsterdam Mohawks. Ashworth posted an ERA of 2.02, which was the third lowest in the PGCBL among qualified pitchers. The right-hander started nine games for coach Keith Griffin and led the Mohawks with 49 innings pitched. He struck out 45 batters in those 49 innings, second most in the league. Opponents hit just .194 off the Fairfield product. Jon Escobar has been named to the first team All-PGCBL after leading the league with nine saves. Escobar appeared in 19 games for coach Paul Alteri and went 2-0 with a 1.33 ERA in those 19 appearances. He struck out 39 batters in 20.1 innings pitcher, good for 17.26 strikeouts per nine innings ratio. Opponents hit .118 off Escobar and right-handed batters went just 4-for-45 (.089) off him. Escobar’s WHIP was 0.85, lowest on the Watertown Rams. Thomas Hackimer has been named to the first team All-PGCBL after posting a 0.98 ERA for the Amsterdam Mohawks. Hackimer appeared in 17 games and notched six saves and went 3-0 for the Mohawks. In 27.2 innings, he struck out 44 batters, good for a 14.31 strikeouts per nine innings ratio. Opponents hit just .138 off the St. John’s product and right-handed batters went just 7-for-63 (.111). Hackimer only gave up two extra base hits all season. For more information on the PGCBL, visit www.pgcbl.com.